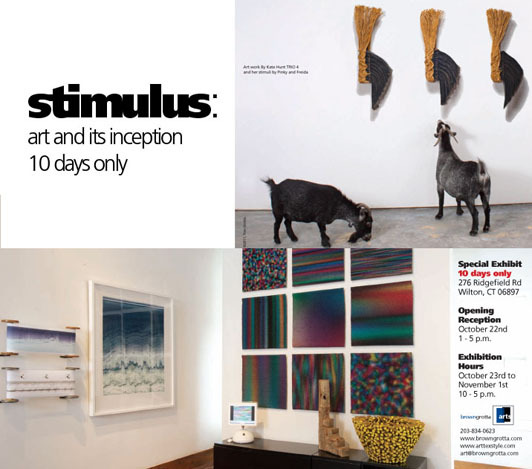 The Artists Opening and Reception, Saturday, April 28th from 1-6 p.m.
Daily Hours, April 29th through May 6th, from 10 a.m. to 5 p.m.
A 144-page full-color catalog, Blue/Green: color/code/context, will be available on April 28th. 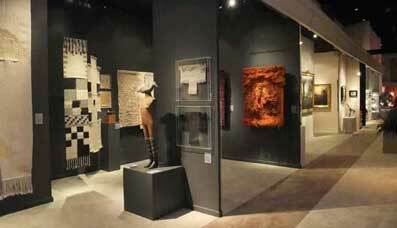 The catalog includes an essay by Leatrice Eiseman, a color specialist whose expertise is recognized worldwide. She heads the Eiseman Center for Color Information and Training and is also executive director of the Pantone® Color Institute. She is the author of 10 books on color, including Color: Messages and Meanings a Pantone® Color Resource and most recently, The Complete Color Harmony, Pantone® Edition. 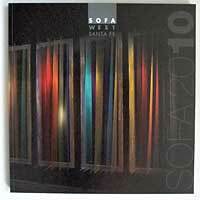 You can preorder the catalog now at: http://store.browngrotta.com/blue-green-color-code-context/. 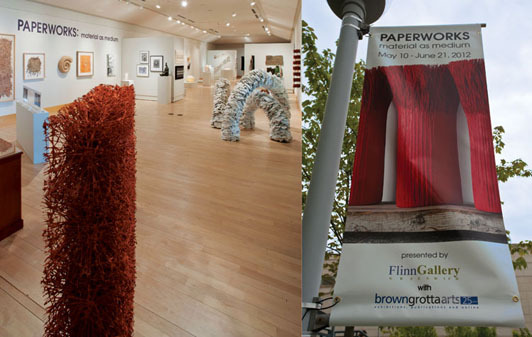 Wednesday, May 2, 2018, 5 -8 p.m.
Join Tom Grotta and Rhonda Brown, co-curators of browngrotta arts and renowned tapestry artist, Helena Hernmarck for a presentation on contemporary fiber art — tapestries, baskets, objects, sculptures — and ways to integrate this art form into contemporary and traditional interiors. Also included: cocktails, canapés and a tour of Blue/Green: color/code/context, an art exhibition featuring more than 50 artists from 15 countries. 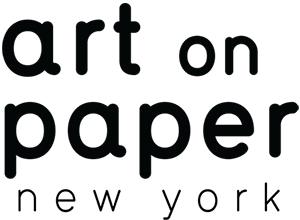 Continuing Education Credit 1.0 (CEU) available through IDCEC. 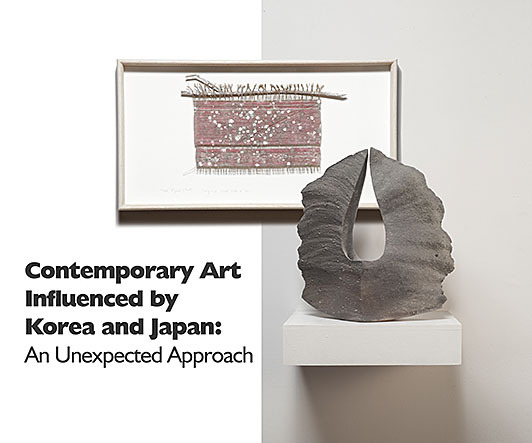 This September the Greenwich Arts Council will present 60+ works by 23 artists from Japan, Korea and the United States in Contemporary Art Influenced by Korea and Japan: An Unexpected Approach. 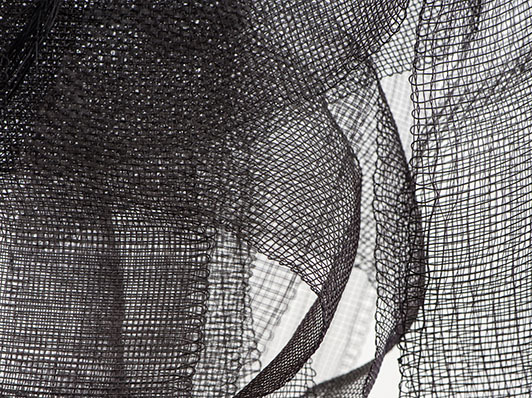 Included are artists who have built on centuries of inherited national aesthetic and technical traditions, as well as artists who have adopted some of the expansive vocabulary of contemporary Asian artistry. 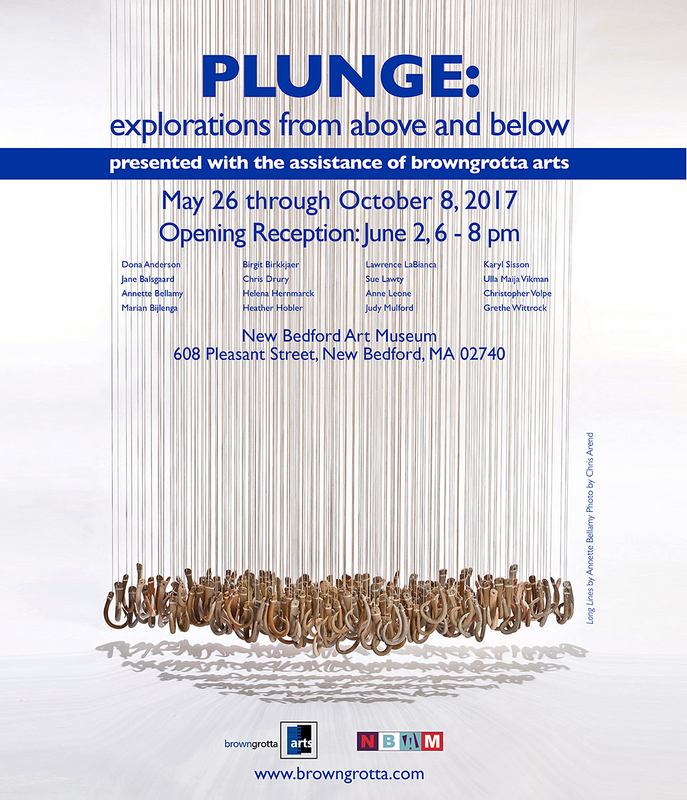 From September 16th to November 4, 2016, the Greenwich Arts Council will present Contemporary Art Influenced by Korea and Japan: An Unexpected Approach, curated by browngrotta arts. 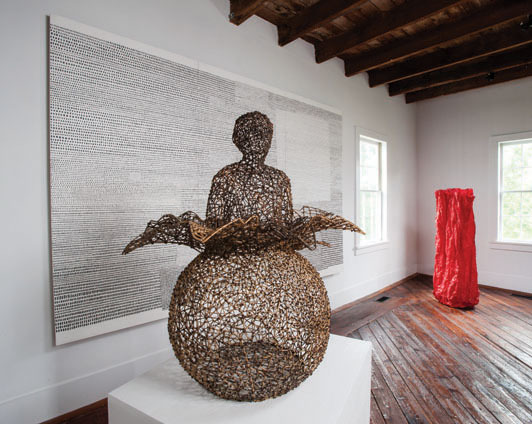 The exhibition includes select works of ceramics, textiles, baskets and sculptures by artists from Japan, Korea and the United States that each reflect an Asian sensibility. 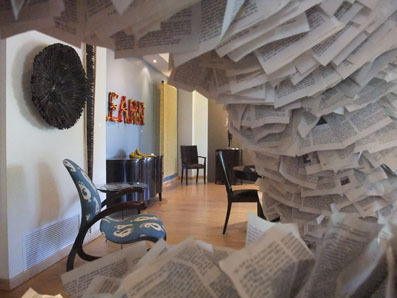 The 23 artists in this exhibit have a close relationship to a traditional, culturally associated craft aesthetic, manifested in a contemporary manner. 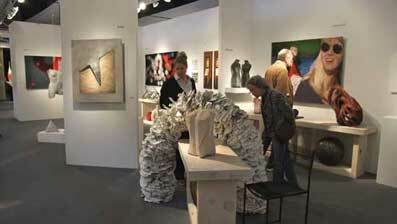 They have chosen conventionally Asian materials and/or techniques (dyes, papers, gold leaf, persimmon tannin, kategami) used in both time-honored and unconventional ways. 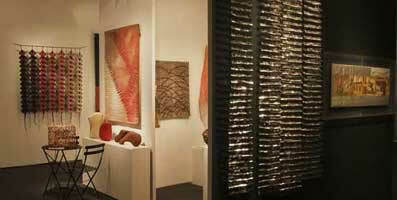 For example, the ritualistic studies by Hiroyuki Shindo on the vanishing art of natural indigo dyeing and by Jun Tomita on the subtlety of kasuri, or ikat, dyeing; Jennifer Linssen’s innovative sculptures of katagami and Keiji Nio’s Interlacing-R, which references complex Japanese sumihimo braiding but uses nylon tapes instead of threads, thus expanding the scale. 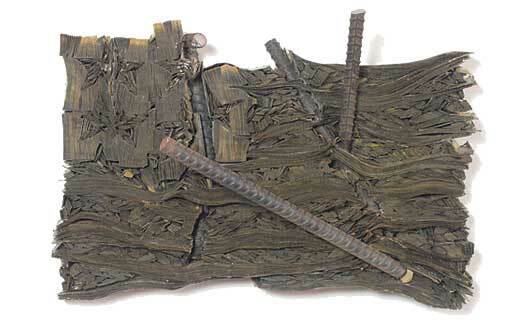 Also strikingly contemporary are works by Masakazu Kobayashi, Naomi Kobayashi, Naoko Serino and Toshio Sekiji, who create new relationships among disparate material and techniques. In other works, like Kiyomi Iwata’s Auric Gold Fold, Glen Kaufman’s Shimogamo Scrolls: Studio View II and Jin-Sook So, Pojagi Constructions I and II, gold and silver leaf play a role, their luster and longevity suggesting immortality, power, divinity. 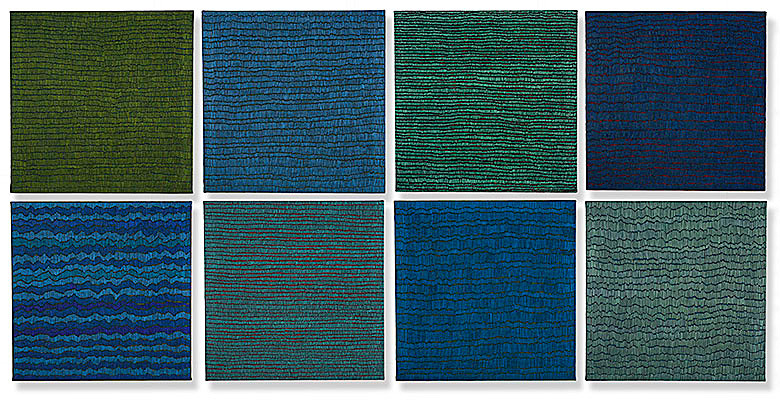 All these artists share a concern for surface and for the interactions of materials, evident in Chiyoko Tanaka’s Grinded Fabric-Three Squares Blue Threads and Blue #689, of linen distressed with earth and stones and Hideho Tanaka’s Vanishing and Emerging series of stainless steel and singed paper. 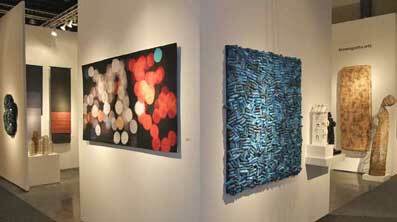 The artists in Contemporary Art Influenced by Korea and Japan: An Unexpected Approach create work that is formal and contained while visibly involving the hand of the artist. 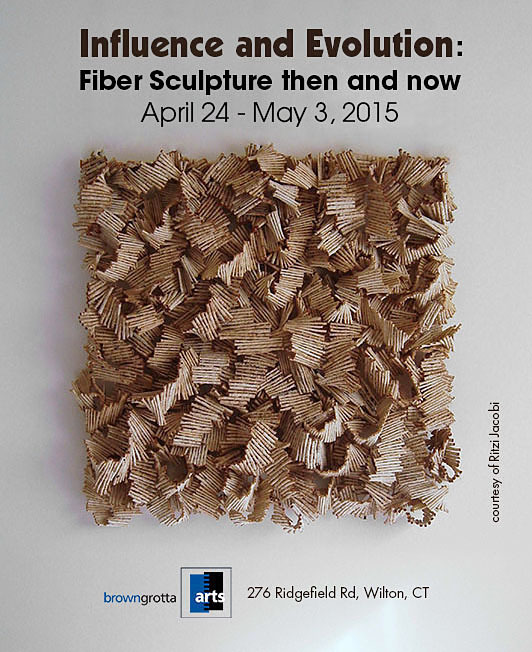 Artists Reception and Opening: Saturday April 30th 276 Ridgefield Rd Wilton, CT 12 - 6 p.m. The Baby Boomers, born between 1946 and 1964, have made an indelible mark. The oldest will be 70 next year; the youngest 52. There is some debate over what constitutes a "Baby Boomer” culturally, but as a group, says Wikipedia, they were the wealthiest, most active and most physically fit generation up to that time and among the first to grow up genuinely expecting the world to improve. They have tended to think of themselves as a special generation, very different from those that came before. In the 1960s, they created music, literature and art to describe that specialness and the change they were intent on bringing about. 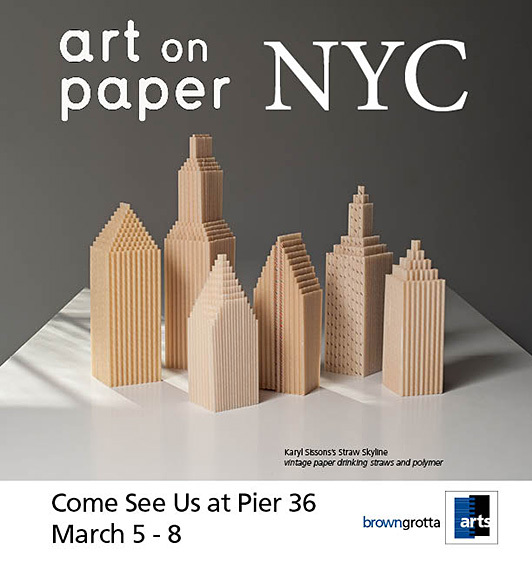 For our 2016 spring exhibition, bga will ask a large group of artists born in the Boomer years to reflect on that legacy, to provide us work that tells us where they’ve come from, where they are going, that illustrates influences, roads not taken and the like. Green from the Get Go: International Contemporary Basketmakers, is curated by Jane Milosch of the Office of the Under Secretary for History, Art and Culture, Smithsonian Institution, former curator of the Renwick Gallery, Smithsonian American Art Museum and Rhonda Brown and Tom Grotta of browngrotta arts and has traveled to venues in Pennsylvania and Michigan. Next Spring it will debut at the Morris Museum in New Jersey. Throughout history, artists and craftspeople have been highly attuned to the beauty and resources of the natural world, whether depicting a pristine landscape, untouched by man, or harvesting plants and minerals for pigments and brushes. Sustainability is a natural part of their design and craft process. 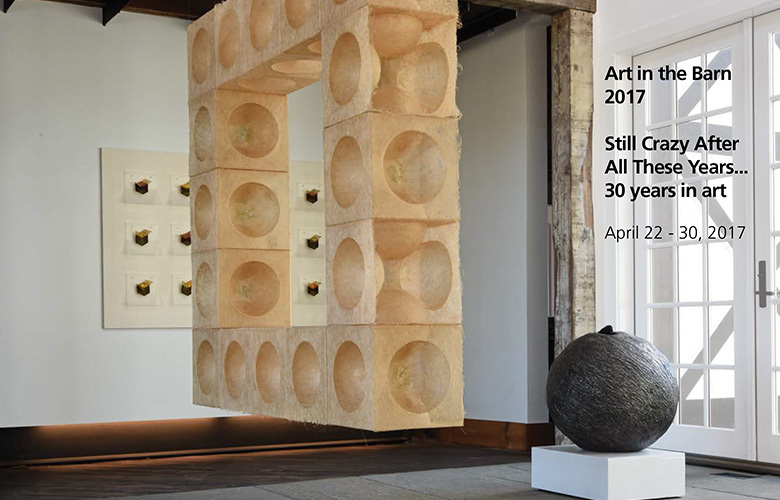 Green from the Get Go will include more than 70 works by artists from Canada, Europe, Japan, Scandinavia and the US, featuring innovators in the genre of 20th-century art basketry as well as emerging talents. 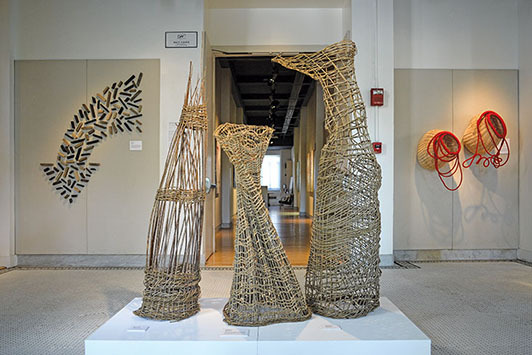 These artists take their inspiration from nature and the history of basketry. 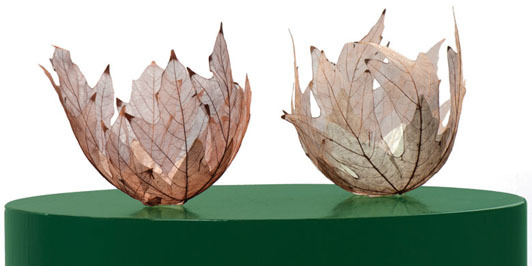 Their work reveals a heightened sensitivity to the physicality of materials, one that honors the stewardship of nature by their choice and use of materials. Nine invited architects who have designed/upgraded houses in Wilton including our architect David Ling and our art barn. Symposium April 29th 2:30-3:30 Subject: an informal discussion of architecture and how it can enhance the value of a house, give pleasure to its occupants, plus other architectural and design topics of interest. 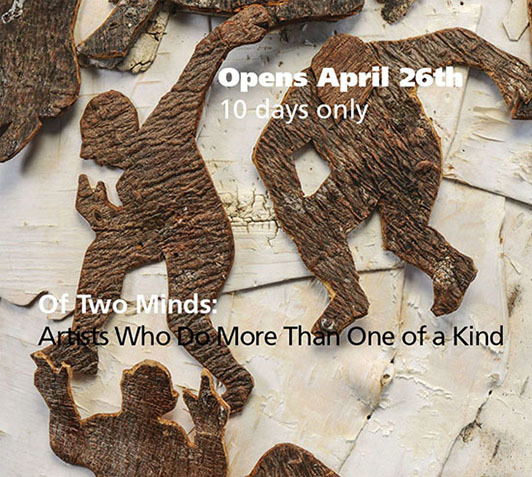 A collaborative show with browngrotta arts of Wilton, CT.
"Highlights include new large fiber-tapestry reliefs by the veteran textile artist Ritzi Jacobi at browngrotta arts from Wilton, Conn.; sensuous biomorphic sculptures made of burnished steel nails and charred wood by Korean artist Jaehyo Lee at CRFA (Cynthia Reeves Fine Art) from New York; abstracted sculptures of kimonos made from salvaged steel by Gordon Chandler at Ferrin Gallery from Pittsfield, Mass. 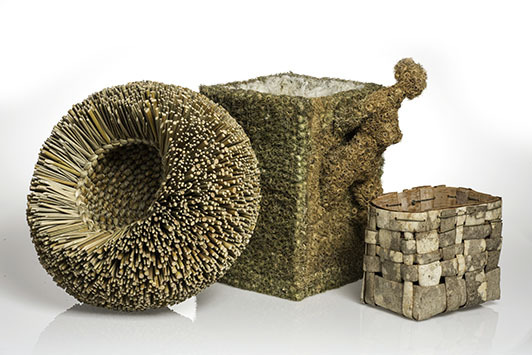 ; shell-inspired Shigaraki clay ceramics by Japanese artist Koike Shoko at Joan B Mirviss Ltd from New York; and 3D collages by bead artist Jan Huling at Lyons Wier Gallery from New York." 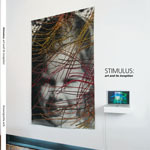 Artnet News, April 8, 2010.